It's time once again for ILLUSTRATION FRIDAY. A simple photo collage done in PhotoShop. 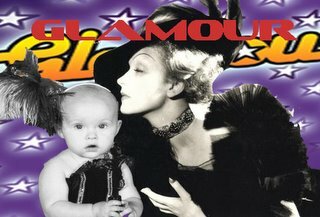 This one is Marlene Dietrich and my granddaughter Micah for the Illustration Friday subject Glamour. this is adorable!!! it is so cool the way you combine the two people, You have a very cute granddaughter and the outfit is ooh-la-la!